After being buried for centuries, 110 new warrior statues have been unearthed in Xi’an, China. The statues are part of a collection of more than 7,000 life-size figures of warriors and horses called the Terracotta Army. The clay sculptures were built in 210 B.C. to guard the tomb of China’s first emperor, Qin Shihuangdi. The Terracotta Army statues were discovered by a group of farmers in 1974. While digging a well, the workers found three pits filled with the lifelike figures, which were made of a type of terra-cotta clay. 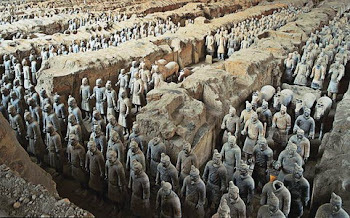 Experts say that long ago, Emperor Shihuangdi ordered the creation of the clay army, along with a 20-square-mile (52 sq. km.) tomb in which to house it. For 36 years, 700,000 laborers crafted this underground city. It contains models of places and towers, and was protected from intruders by automatically triggered crossbows. The city lay buried for more than 2,000 years. Today, people from around the world visit China to see the terra-cotta warriors. What makes soldier so special? Each figure was individually carved, so they have different hairstyles, expressions, and facial features. The details make the soldiers appear true to life. Inside the pit, the statues are arrange by military rank, the taller the statue. The shortest statue is 5 feet 8 inches tall (165 cm). The tallest is 6 feet 6 inches (198 cm). The lower half of soldier is made of solid clay, while the upper half is hollow. This makes it easier for the figures to remain upright. The discovery of Xi’an’s 110 new warriors comes after a new finding about the Great Wall of China. An archaeological survey revealed that the Great Wall of China is more than twice as long as previous thought. The wall was originally measured to be 5,500 miles (8,851 km) but is now at 13, 170 miles (21,195 km) long. Beijing officials plan to open two new sections of the Great Wall and to expand other areas to make room for more tourist. The first recorder use of toilet paper occurred in China around 851 A.D. Thank you for reading Kwentologists Digging Into China posted on the website Kwentology if you want to redistribute this article please include the link as the source. Have some kuwento to share? Contact us!